AP/Seth WenigRep. 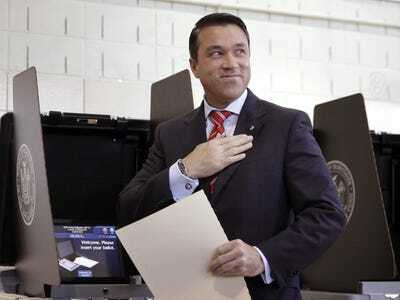 Michael Grimm (R-N.Y.) smiles after voting. He would go on to easily win his race later in the day despite facing a 20-count indictment. The epicentre for House Democrats’ losses Tuesday night was in New York State, where Republicans scored stunning margins or performed better than expected in race after race. “Roughly a quarter of the House losses nationally occurred in New York,” a Democratic insider told Business Insider after marveling at the results. None of the Republican seats Democrats had targeted went their way, even as Rep. Steve Israel (D-N.Y.), the chair of the DCCC, the campaign arm of House Democrats, made a number of those races a priority. Republicans were more than happy to crow about the results. Notably, Rep. Michael Grimm (R-N.Y.) more than doubled his margin of victory this year over 2012 — even though he faced a more experienced opponent, former Councilman Domenic Recchia (D), and had a host of additional troubles. Grimm was indicted last April on 20 counts of alleged fraud and other criminal acts. In January, Grimm drew national headlines when he threatened to throw a reporter off a balcony. But none of that seemed to matter, and Grimm won by about 13%. In a race that wasn’t on any national strategist’s radar, Rep. Louise Slaughter (D) is barely hanging onto her Rochester-area seat even though President Barack Obama won her district with close to 60% of the vote in 2012. Slaughter’s lead is just 582 votes, according to the latest numbers from WNYC. “Well, it wasn’t exactly a landslide, was it?” Slaughter quipped on election night, according to the Rochester Democrat & Chronicle. Nearby, Syracuse Rep. Dan Maffei (D) holds a district Obama won by a similar margin and was blown out of the water by Republican John Katko, 60% to 40%. This is despite the fact that Republicans initially struggled to find a challenger to Maffei. 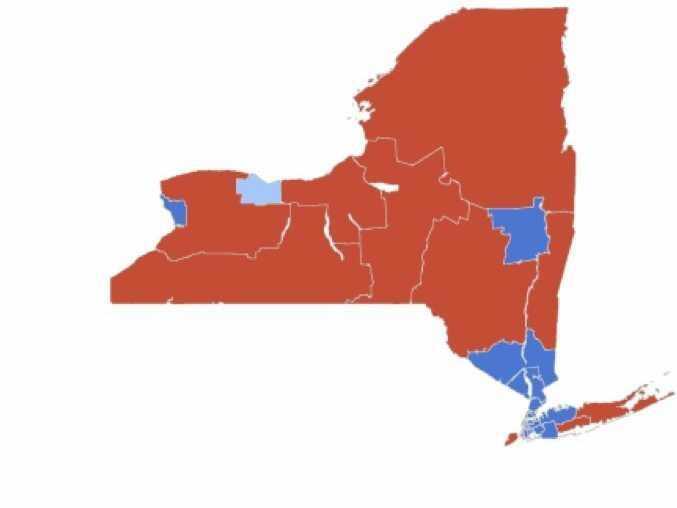 GoogleA Google map of the New York House races shows how heavily Republicans dominated upstate. The losses keep piling up. Thirty-year-old Republican rising star Elise Stefanik grabbed another former Democratic upstate seat by crushing her opponent, the owner of a Brooklyn health food store, by more than 20 points. Long Island Rep. Tim Bishop (D) was easily ousted by a Republican state senator, Lee Zeldin. And in a once-touted race, Sean Eldridge, the husband of Facebook founder Chris Hughes, was trounced by Rep. Chris Gibson (R). Obama won all three of these districts. “Poor recruiting led to a blowout in the North Country. Tim Bishop lost in a landslide in Steve Israel’s backyard, and the DCCC a didn’t even notice that Louise Slaughter almost lost until the results came in,” the Democratic insider lamented to Business Insider. Reached for comment, DCCC spokesman Josh Schwerin pointed to some of their success stories of the night, including Rep. Sean Patrick Maloney (D), who holds a narrow edge against former Rep. Nan Hayworth (R) after a hotly contested campaign. And Republicans once hoped to beat Kathleen Rice in a left-leaning open seat in Long Island. “In a Republican wave year, Democrats were able to limit losses with strong members like Sean Patrick Maloney and candidates like Kathleen Rice winning in seats that House Republicans had claimed were their top targets,” Schwerin said.